Biochar coffee husks is today’s learning curve project. I went to give a demonstration of the Tlud gassifier stoves and a bigger home made Johnny Rodger tlud to green mountain coffee in Northern NSW. It was a wet day and we had the luxury of a beautiful freshly roasted organic coffee to really get our minds into gear for the task at hand with the further effects of unable to keep my mouth closed lol yap yap yapp yada yada yada Nice Coffee. 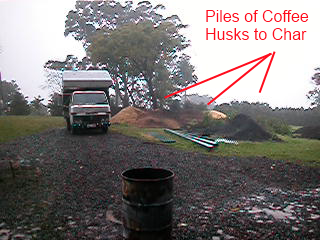 This organic coffee company has a big pile of coffee husks that they would like to turn into biological charcoal and feed the char back to the coffee plants. Simple I thought we will run these through a gasifier and that will be it. We tried introducing more primary air from the bottom but it kept putting the flames out. 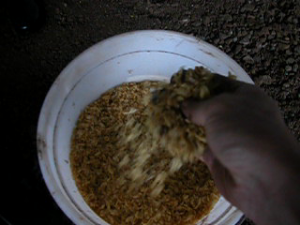 We then tried adding more secondary air from the bottom with no luck either. We tried extending the chimney for better draw and still no improvement. Finally we tried introducing the primary air into the top of the tlud and this seemed to work. Here is what I believe is one of our problems. The coffee husks although very dry are unable to hold a flame so when using them straight in a gassifier they do not stay alight. Because you all know how I like to solve problems. Experiment by myself (this is the harder way). 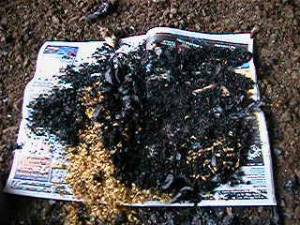 My first idea is to introduce a piece of firelighter charcoal soaked in metho onto the top of the husks in a Tlud this way the charcoal can maintain a flame while the surrounding coffee husks turn into char. What do you think out there in bio char experts land ? Please comment below with any ideas you might have that will help me over come this problem and allow me to write up a informational page for pyrolizing coffee husks. All information will be maintained as open source / public domain so everyone can learn this great new technology. Just came upon your web page and thought you might like to take a look at the modifications we made to John Rogers’ 200 l TLUD based on what little I know from a bit of reading of TLUDs. I’ll send a set of pictures that should give you the basic idea if your page input allows me to, otherwise send me an email address and I’ll send them. An extended set of pictures is available that I would be happy to send if you think they would help. 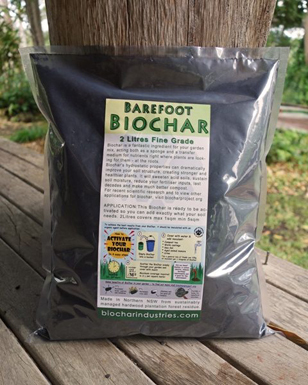 We are calling this biochar oven the UB 200 l natural draft TLUD oven, or the UB T- oven or t-oven for short. But please, please, please don’t call it a stove. afterburner (also with adjustable slip ring intake ports) with chimney. Only a power drill and a power grinder are needed to make the design, although the student who was doing the work had access to a welder and used it to put the handles on the slip rings on the primary air & afterburner air, the male slip coupe for the chimney and the handle for the chimney flue. Easy workarounds could be used if welding is a problem. 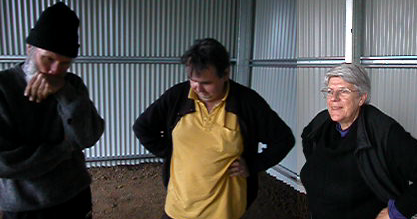 I’ve run two trials so far, both with cow manure that was air dried after being shoveled out of the cowshed. Both runs were smokeless. The first, in which 20-30 x 20-30 x 5-10 cm sized pieces on down burned down in 55 min, the second that was filled with fairly uniform 7-10 x 7-10 x 5-10 pieces together with the fins from chopping up the larger pieces burned down in 1 hr 40 min. The charing was compleat throughout the charge, slightly oily on the ‘ub on the hand’ test. Another run was made (I was absent) using birch branch & twigs segments (2 cm on down) about 10 cm long. They had smoke problems with keeping the afterburner lit in an exposed site on a windy day, but the char came out good. Devising a wind shield should not be much of a problem. Photo 3: The circled square pattern of 45 holes, each 13 mm in diameter. We are very interested in developing these large TLUDs for getting serious amounts of biochar into the ground, leveraging smallholder benefits of biochar in sustainable rural development into timely climate change mitigation. We are thinking of initiating another sib-project based on a virtual community of low-tech biochar producers, TLUD designers and tinkers who would want to test and improve the design. Joining might be a good sub project for your Biochar Project or any of your interested readers. and putting afterburner/chimney in place. It is easy to gasify coffee bean husks in a top-lit updraft gasifier. But a small fan is needed to force air through the husks. I use a small 40 x 40 mm fan, and the speed of the fan is controlled by a speed regulator. The amount of power consumed by this fan in the gasification of coffee bean husks is generally less than one watt. Virtually no smoke is created during the gasification of coffee bean husks. I did a similar experiment with much drier coffee husks, and I got a much bluer flame that what you see in these two pictures. All of these gasifiers are fabricated out of stainless steel so that they can be used over many years. My 100 gasifier sells for about $30 US. The 150 gasifier sell for about $50 US. This is a totally non-profit effort. I also design larger gasifiers of a 100 kW capacity. Here equipment price drop to less than $5.00/kW. I need to communicate join your project .because your project is productive in 21 century. This is great. Please continue doing a project that will benefit to our environment.